Caley Thistle defender Jamie McCart. Caley Thistle defender Jamie McCart is confident he will not be thrust in from the cold when his side travel to Alloa Athletic in the Championship today. McCart has yet to start a league match since rejoining Inverness on a permanent deal from Celtic in the summer, but is likely to be given the nod by manager John Robertson this afternoon due to Coll Donaldson being suspended. McCart played the final 10 minutes of last weekend’s 1-1 draw against Dundee United following Donaldson’s dismissal, and despite his lack of game time the 21-year-old says he has kept himself alert for Robertson’s call. McCart said: “I have had to be patient for game time since I have been here, especially in the league, so hopefully I will be given an opportunity. “It was a difficult period of the game to come on against Dundee United, after we had gone down to 10 men in that atmosphere when they were pushing for a goal. 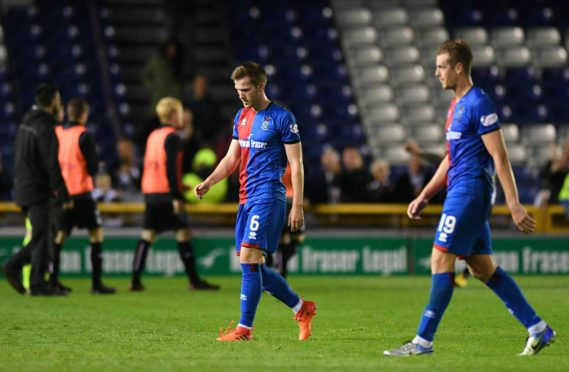 Inverness’ unbeaten start to the league campaign has left them five points adrift of leaders Ross County after nine games, and despite coming into today’s game on the back of four successive draws, McCart feels his side are still within sight of the league’s pacesetters. He added: “The boys have done well. There have been different scenarios in games, they have had to come up with different answers. “They have varied their game well. There have been a few tough games in there where they have fought hard to win, and there have been ones where it has been comfortable. “It has probably been credit to most of the boys and their work ethic towards it. “I’m sure everyone would like to turn a few more of the draws into wins to push further up, but to stay unbeaten is always a good thing. “We are still in and around it. Ayr have had a brilliant start to the season, although it was obviously a disappointing one last week for them against County. McCart spent the latter part of last season on loan with Alloa, helping the Wasps secure promotion from League 1. McCart is wary of Jim Goodwin’s men, who secured a 2-2 draw at Caledonian Stadium in August and go into today’s game fresh from their first league win of the campaign against Partick Thistle last weekend. He added: “They have done well. They came up here and gave us a tough game, they got a point in the end. “They made it difficult for us and I would expect the same. “Their last couple of results will have been a good confidence booster for them, but I don’t think we would need that in the first place. “I think we would always treat everyone with the same respect regardless of what team they were, whether they were newly-promoted or seasoned veterans in the league.